Herman Stickney graduated from the U.S. Naval Academy at Annapolis, Class of 1888. He retired as a Rear Admiral in the U.S. Navy. The President of the United States of America, in the name of Congress, takes pleasure in presenting the Medal of Honor to Commander Herman Osman Stickney, United States Navy, for distinguished conduct in battle during the engagements of Vera Cruz, Mexico, 21 and 22 April 1914. 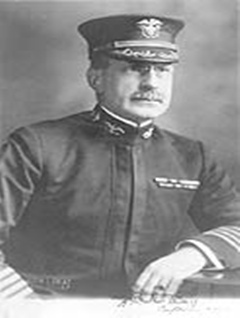 Commander Stickney covered the landing of the 21st with the guns of the Prairie, and throughout the attack and occupation, rendered important assistance to our forces on shore with his 3-inch battery.